SPRINGFIELD, Il — US Senator Barack Obama formally kicked off his bid for president on February 10, preaching his message of hope and transformation to a crowd of 17,000 supporters. Obama began his speech by saying, “praise and honor to God,” then he channeled the legacy of former President Abraham Lincoln, who like the senator served in the Illinois state legislature in Springfield before moving on to the White House. “In the shadow of the Old State Capitol, where Lincoln once called on a divided house to stand together, where common hopes and common dreams still, I stand before you today to announce my candidacy for President of the United States of America,” he declared to the cheering crowd. Obama, a Democrat, cast himself as the heir of the Republican Lincoln, offering his brand of leadership in a time of war. It was during Lincoln’s presidency when the Civil War broke, followed by the freeing of African-American slaves, an historic event not lost in Obama’s address. 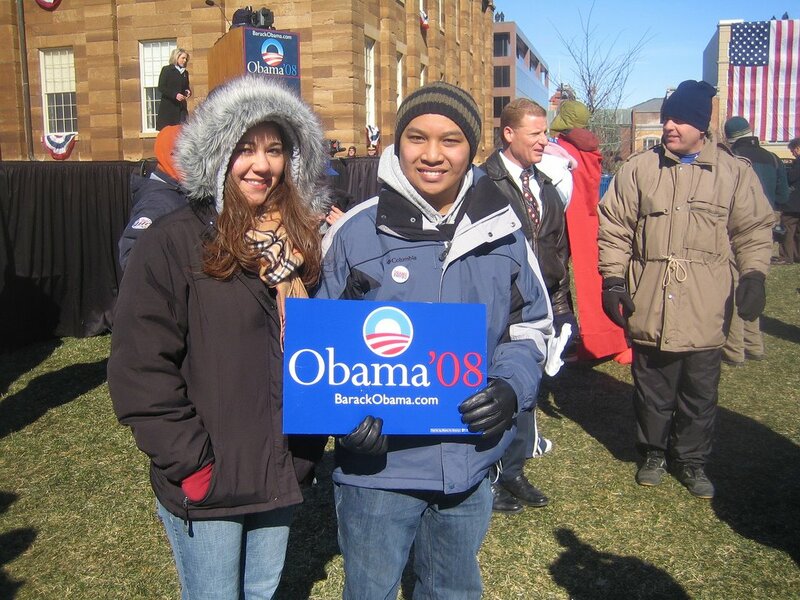 Among the throng of supporters who heard the call to action of the first African-American to run for the U.S. presidency were the young Filipino Americans like Justin Cajindos and Julien Abrea Baburka, both history and political science majors at the nearby University of Illinois in Urbana-Champaign. “It was a fantastic delivery, and I think that he made the right balance between substance and lofty inspiration,” said Cajindos of Hickory Hills, Illinois. His parents hail from Baguio City and Bambang, Nueva Vizcaya. Cajindos said he has been “a long-time supporter” of Obama, first when he ran for the US Senate in 2004. In 2005, he worked as an intern in Obama’s office in Washington D.C.
Baburka added: “He comes from the diverse culture and he is also very charismatic, qualities that we are yearning for.” Baburka’s mother is a native of Southern Leyte in the Philippines. Reporters from various Filipino-American media companies were also present to record the event for the Filipino readers and television viewers across the US. They traveled three hours south from Chicago, joining an estimated 530 other journalists covering the event from the US and around the world. In Chicago Atty. Vanessa Vergara of the Filipino Civil Rights Advocates said “there isn’t a formal, organized Fil-Am effort quite yet.” But Vergara and her lawyer husband have been supporting Obama ever since he was an Illinois state legislator, representing Chicago’s South Side. Last Sunday, February 11, Vergara attended a fundraiser for the senator. Another Filipino American expected to work for Obama’s election is Atty. Aurora Abella-Austriaco, the first female and minority president of the Illinois Real Estate Lawyers’ Association, an organization of more than 1,200 real estate attorneys throughout Illinois. Obama and Austriaco, who was named one of Today’s Chicago Woman’s “100 Women Making a Difference” in 1997 and 2000, are on first-name basis. Obama personally campaigned for Austriaco when she latter ran, unsuccessfully, for a seat as Maine Township Trustee. Austriaco lives in the Chicago suburb of Park Ridge, hometown of Obama’s chief rival Sen. Hillary Clinton of New York. He also proposed a universal health care for all Americans and an end to dependence on foreign oil. In a speech full of symbolism, he sought a page from former President John F. Kennedy’s playbook, talking about “a new generation” of leadership. Kennedy was Obama’s age when he won the presidency. 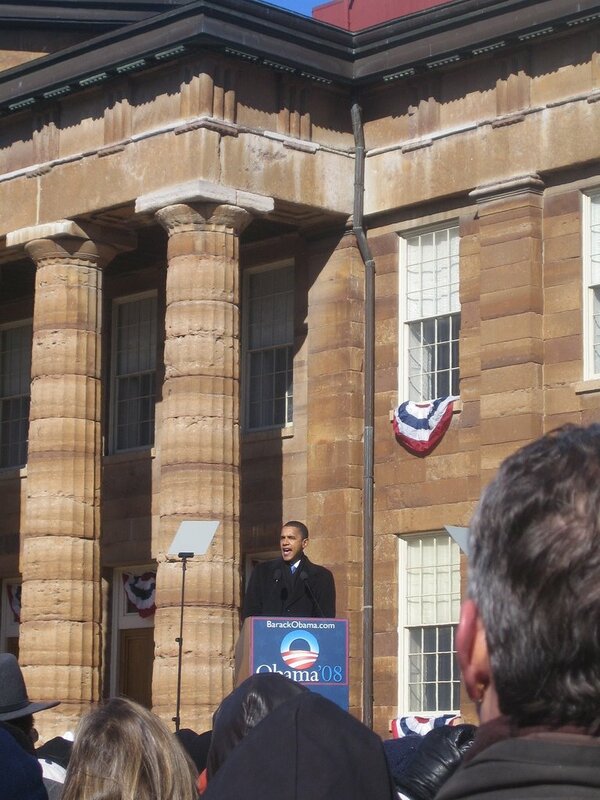 Illinois Attorney General Lisa Madigan said “it’s not a surprise” that Obama delivered an “extraordinary” speech. “He’s the embodiment of the diversity of this country and he has that unique ability to energize people. 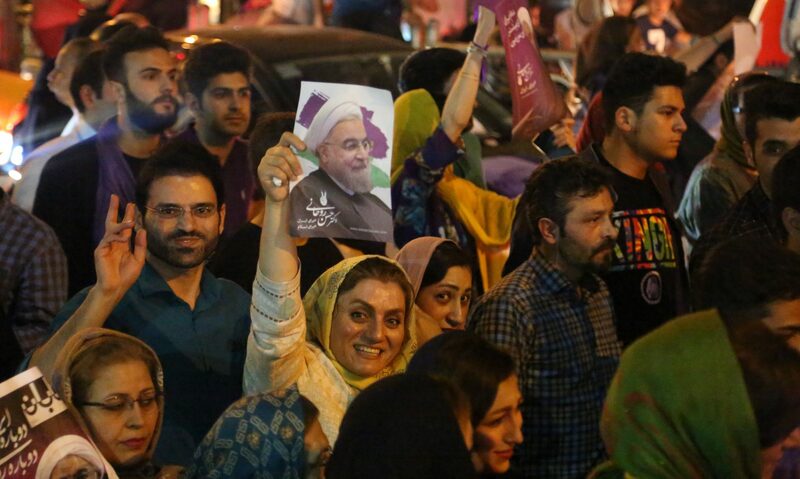 He has mass appeal,” Madigan said. Not all are ready to join the movement dubbed by the media as Obama-mania, however. While enjoying a late afternoon lunch at a nearby pizza inn, a World War II veteran who fought in Europe, said he has “mixed feelings” about this candidate. Earlier as Obama started his speech, a small crowd of anti-abortion protesters carrying signs “Life Yes, Obama No” shouted their disapproval of his candidacy. Volunteers manning the security prevented them from entering the rally grounds that was blocked by railings, but they managed to get the attention of the media. Meanwhile, a middle-aged African-American woman, who refused to be identified, expressed her concern about his safety. “It would be nice to have an African-American president, but I am afraid that if he will get too far, they will hurt him,” she said, adding that a lot of people feel threatened by Obama’s rise to power. Obama, 45, was born in Hawaii. His father was a black from Kenya and his mother, a white from Kansas. As a kid, he lived with his mother, Indonesian step-father, and half-sister in Jakarta before moving back to Hawaii, where he was raised by in white household by his grandparents. After high school, he studied for two years at Occidental College near Los Angeles, California, before transferring to Columbia University in New York, where he majored in International Affairs. After graduation, he moved to Chicago and worked as a community organizer in the city’s South Side, receiving $13,000 a year. He later graduated from Harvard Law School, where he served as the first black editor of the Harvard Law Review. After law school, he returned to Chicago, where he met his wife Michelle. In 1996, he ran for the Illinois Senate where he served for four terms. He worked to reform the death penalty system and helped enact new ethics legislation. In 2000, he challenged another African-American, Congressman Bobby Rush. He lost that election, but later earned Rush’s backing to run for president. In 2004, Obama launched his Senate campaign, which many political observers thought was not winnable. After clinching the nomination later that year, he delivered the keynote address at the Democratic Party convention, catapulting him to national prominence and his eventual run for president.